After finishing the school year and therefore have set point and followed the Education Program Development in the schools of the Community of Madrid, Humana has started in various summer camps children a series of workshops on education, for children 8 to 12 years. The objectives of these workshops is to encourage creativity by making puppets with recycled materials, with special attention to the clothes, and learn to reflect on the small actions citizens can take to contribute to sustainable development and progress of the communities disadvantaged. 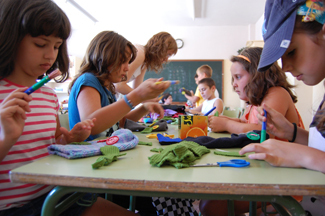 For the moment they have carried out such activities under the school's summer camp in Leganes Andrés Segovia, with the participation of a dozen children. 7, 8, 11 and July 12 have organized similar workshops in the camps of schools Blas de Otero, Alfonso Rodríguez Castelao, Rafael Alberti and Blessed Simon de Rojas, respectively, all in Móstoles. The next September Humana resume education program development in schools. For more information, click here.